To Cite: Shakeri Abdolmaleki A, Gholamalizadeh Ahangar A, Soltani J. Artificial Neural Network (ANN) Approach for Predicting Cu Concentration in Drinking Water of Chahnimeh1 Reservoir in Sistan-Balochistan, Iran, Health Scope. 2013 ; 2(1):31-38. doi: 10.17795/jhealthscope-9828. Background: Access to safe drinking water is one of the basic human rights and essential for healthy life. Concerns about the effects of copper on human health have led to numerous guidelines and regulations limiting its concentrations in water. Objectives: The major goal of this study is to demonstrate artificial neural network model of the Chahnimeh1 reservoir water quality (Heavy metal concentration) and show the potential of the ANN for producing models capable of efficient forecasting of Cu concentration. Materials and Methods: Water samples were collected from Chahnimeh1 reservoir which was the most important source of drinking water in Sistan-balochistan and analyzed for physical quality parameters such as: EC (electric conductivity), TDS(total dissolved solids), T(temperature), pH and heavy metal (Cu) concentration using standard methods. In this study, a three-layer artificial neural network (ANN) model was investigated to predict the Cu concentration in the water of Chahnimeh1 reservoir. The input variables are electric conductivity, total dissolved solids, temperature and pH, while the Cu concentration in water is the output. We applied The Levenberg–Marquardt (LM) algorithm to train ANN. Results: According to the ANN outputs, hidden layer with 7 neurons had the best performance for predicting Cu concentration. 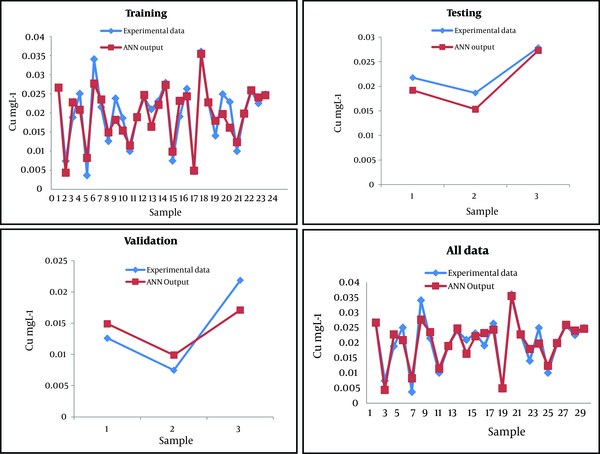 Evaluation indexes including MSE and R in this article were obtained as 0.00008 and 0.9346; 0.00019 and 0.8612; 0.00014 and 0.9372 for training, validation and testing date sets respectively. Conclusions: As we can see the ANN outputs values are very close to actual Cu concentration, so indicating that predicted values are accurate and the network design is proper and the input variables well suitable for the prediction of Cu concentration. Water quality (WQ) is a description of biological, chemical, and physical characteristics of water in connection with intended use(s) and a set of standards (1-3). Hence, water quality assessment can be defined as the evaluation of the biological, chemical and physical properties of water in reference to natural quality, human health effects, and intended uses (4, 5). Heavy metal pollution leads to serious human health hazards through the food chain and the loss of biodiversity, and harms the environmental quality. Recent researches into trace elements and heavy metals show highly interesting records (6). Escalated anthropogenic activities in the basins and reduced river discharges registered during the last few decades have caused increase in the organic and inorganic pollution load of the surface water body (7). Copper is essential for good health. However, exposure to higher doses can be fatal. Long term exposure to copper results in nose irritation, mouth, and eyes, and cause headache, and diarrhea (8). Copper status has also been associated indirectly with a number of neurological disorders, including Alzheimer’s disease and prion diseases, including bovine spongiform encephalopathy. Exposure of humans to copper occurs primarily from the consumption of food and drinking water. The relative copper intake from food versus water depends on geographical location; generally, about 20–25% of copper intake comes from drinking water (9). Nonetheless, the WQ can be evaluated by a single parameter for certain objective or by a number of critical parameters selected carefully to represent the pollution level of the water body of concern and reflect its overall WQ status. However, since no individual parameter can express the WQ sufficiently, the WQ is normally assessed by measuring a broad range of parameters (temperature; pH; electric conductivity (EC); total dissolved solids (TDS); and the concentrations of the heavy metals).Although, parametric statistical and deterministic models have been traditional way for modeling the water quality, but these require vast information on various hydro logical sub-processes in order to arrive the end results. In recent years, several researches have been conducted on water quality forecast models (10, 11). However, since a large number of factors affecting the water quality have a complicated non-linear relation with the variables; traditional data processing methods are no longer good enough for solving the problem (12, 13). On the other hand, the artiﬁcial neural networks (ANNs) capable of imitating the basic characteristics of the human brain like as self-organization, self-adaptability, and error tolerant and have been widely adopted for model identiﬁcation, analysis and forecast, system recognition and design optimization (14). Many statistical based water quality models, assume the relationship between variables to be linear and the distribution of those to be normal, however, ANNs has the ability of indicating non-linear relationship between variables(15). In recent years, ANNs were applied for modeling various kinds of research topics (16-18). ANN models have been successfully employed to the water quality prediction in reservoir, stream and groundwater(19-22).Artiﬁcial neural network (ANN) modeling has the potential to reduce computation time and effort and possibility of errors in the calculation. The major goal of this study is to demonstrate the artificial neural network model of the Chahnimeh1 reservoir water quality (Heavy metal concentration) and show the potential of the ANN for producing models capable of efficient forecasting of Cu concentration. Here, we have investigated the possibility of training. The Cu concentration of the reservoir water was taken as the dependent variables here and the independent variables contain physical water quality data sets. In this paper, ANN models have been identiﬁed for computing the concentration of Cu in the reservoir water. The artificial neural network is a useful computational way for predicting and modeling abstruse relationships among parameters, especially when there is no explicit relation among parameters (23, 24). The structure of artificial neural network basically consists of three layers, the input layer that all the data are imported to the network and calculation of the weight of each input variables are done, the hidden layer or layers whose data are computed, and the output layer, that the artificial neural network results are obtained. Every single layer includes one or more fundamental section (s) called a node or a neuron (25). The problem is the key factor that can be determined in the number of neurons in the layers. The small number of hidden neurons is a limiting factor to learn the process carefully, even though too high number scan be very time consuming, and the network may over fit the data (26). In this study, three-layer neural networks were constructed for computation of the reservoir metal concentration (Cu). All the computations were performed using the EXCEL 2003 and MATLAB (Version 7.12, MathWorks, Inc., Natwick, MA). Where Zj is the output of node j, the sigmoidal function is between 0 and 1, thus the input as well as output data should be normalized to the range between 0 and 1 (31). Hence, normalization of values within a uniform range is vital to prevent data with larger magnitude from overriding the smaller ones. In the present work, scaling of the data to the range of 0–1 was carried out as follows (32): Where is the normalized value, X, and are (R?) the actual, the maximum and the minimum value of data sets respectively. The aim of testing various network designs was to find weight values of the network with minimum error (28). The indexes that showed efficiency of network were MSE and R(33):where n is the number of points, is the output value got from the neural network model, is the experimental value, and is the average of the experimental values. Sistan-Balochistan is one of the 31 provinces of Iran and is the first largest state in terms of land area (187502 km2). It is bordered by Khorasan province from the north, Afghanistan and Pakistan from the east, Oman Sea from the south and the Kerman province from the west. Chahnimeh1 reservoir is located in the Sistan-Balochistan region that has a series of natural depressions used primarily to store water for irrigation and public water supply (34).They are not only used to store water, but also have profound impact on prevent floods. During periods of high flows, water is diverted to these reservoirs via an intake and canal which has a capacity of up to 1000 m3/s (Figure 1). 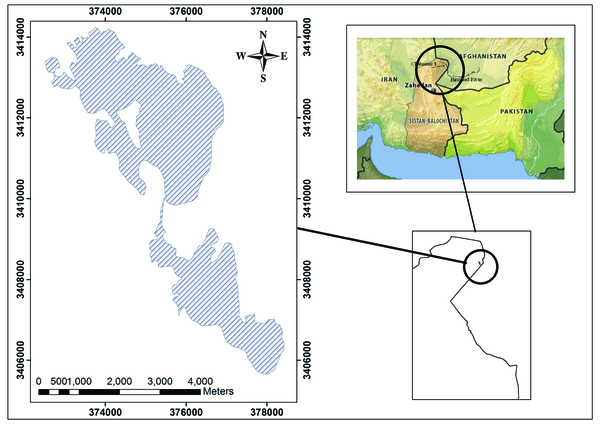 The data set used in this study was generated through measuring water quality of Chahnimeh1 in Sistan-Balochistan. The sampling sites are spread over a distance of about 20kmand 2 water samples were collected in spring 2011. Grabbed water samples were collected from two depth of water column (20 cm below the surface and bottom of the reservoir) (35). All the water samples collected during the study period were analyzed for temperature; pH; electric conductivity (EC); total dissolved solids (TDS); and the Cu concentrations. For analysis total copper of all water samples must be acidified at the time of collection with HNO3 (5 mL L-1). Transfer a 100-mL aliquot of well-mixed sample to a beaker then add 2 mL of concentrated HNO3 and 5 mL of concentrated HCl. The sample is covered with a ribbed watch glass or other suitable covers and heated on a steam bath, hot plate or other heating source at 90 to 95 C until the volume has been reduced to 15-20 mL, then adjust the final volume to 100 mL with reagent water and read the concentration of Cu by flame atomic absorption spectroscopy (36). Physical water quality parameter including (EC, T, TDS and pH) is determined with portable tool (HANNA instrument model: HI 98129) (37). To enable modeling of nonlinear and complicated functions, feed-forward neural network has been used with one or more hidden layers (28). Nevertheless, it is very hard to choose the number of hidden layers (30). Most of literatures indicate that one hidden layer is good enough to validate the prediction and maybe the best to decide for all applied feed-forward network design (38). Thus, in this paper one hidden layer was used for modeling (Figure 2). It is crucial to highlight the determination of the number of neurons in hidden layers. Neurons played an important role that effected on the general characteristics of network and training time (27). The complexity of relationship among parameters determined the number of neuron in the hidden layer (39). The optimum number of neurons in a hidden layer was found by trial and error. The network has trained with various kinds of learning algorithms but knowing about their suitability and fitness is not an easy task to do. In our research, Levenberg–Marquardt back propagation (LM) algorithm applied in order to train ANN. The LM is an approximation to the Newton’s method (40).The results show that the best performance of network design included 3 different layers: input layer, hidden layer consist of 7 nodes on it as well as output layer. The evaluation indexes MSE and R calculated 0.00008 and 0.9346;0.00019 and 0.8612 for training set; 0.000014 and 0.7348; 0.0004 and 0.9372 for validation set, testing set and all data set respectively. Prediction accuracy of all data set (training, validation and testing) is high enough as shown in Table 1. Predicted values of the best model also showed in Table 1. Table 2 shows that values of MSE are very little indicating that predicted and actual values were close enough. Sensitivity analysis is a tool to determine how “sensitive” a model is to changes in the parameters of the model as well as its structure. In this part, parameter sensitivity is a center of attention. Parameters sensitivity in this research performed as a series of tests on ANN model to understand how a change in the parameter can lead to a change in evaluation indexes including both MSE and R. Sensitivity analyses of all possible composition variables were done. The optimum network with lowest MSE and highest coefficient of correlation (R) was in group of four variables. P1, electric conductivity (EC); P2, total dissolved solids (TDS); P3, temperature (T); and P4, pH are the input variables. Table 3 shows the results of Sensitivity analysis. As it can be seen in Table 3, in the group of 1 variable p3 (T) is the most effective parameter because of its best evaluation indexes (lowest MSE and highest R), according to the Table 3, the best MSE and R were obtained with combination of P2 (TDS) and P3 (T). The best group of 3 variables were obtained with interaction of best group of two variables (P2 + P3) and applied with P1 (EC). The values of MSE and R become better in the case the interaction of P1 + P2 + P3 combined with P4 to access the optimum values of MSE and R.
The experimental data and ANN modeling prediction were juxtaposed in Figure 3. According to Figure 3, excellent agreement between experimental data and ANN results was indicated. In this research, ANN was used for prediction of Cu concentration in the water of the Chahnimeh1 reservoir (Iran). The identified models were trained, validated and tested on Cu concentration measured during spring 2011. The network designs including 4 input variables, 7 hidden neurons and 1 output neuron were found to be suitable for this study. We propose the neural network as effective tool for the computation of reservoir water quality and it could also be used in other areas to improve the understanding of reservoir pollution indexes. The ANN can be seen as a powerful predictive alternative to traditional modeling techniques. The authors thank Mr.Mohammad Shakeri for technical support and University of Zabol for providing financial support. Implication for health policy/practice/research/medical education The results of this research will be helpful for researchers who are interested in water pollution control, water quality as well as health policy makers. Please cite this paper as Shakeri Abdolmaleki A, Gholamalizadeh Ahangar A, Soltani J. Artiﬁcial neural network (ANN) approach for predicting Cu concentration in drinking water of Chahnimeh1 reservoir in Sistan-Balochistan, Iran. Health Scope.2013; 2(1): 31-8. Authors’ Contribution This study has been done equally by authors.